We offer a frozen custard business plan that will show you how to get started in the frozen custard business. 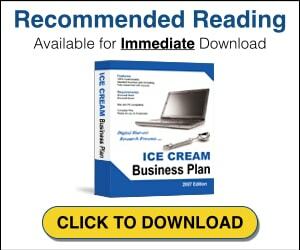 It will help you plan for the success of your frozen custard business and provide equipment lists and start up costs. We’d also like to provide you with a background on the frozen custard industry and how frozen custard is made. What is Frozen Custard and How is Frozen Custard Made? Frozen custard is a cold dessert similar to ice cream, but made with all natural ingredients including eggs, cream, and sugar. To truly be considered frozen custard, it typically contains at least 10% butterfat, 1.4% egg yolk and made fresh throughout the day. Using a process called overrun, air is blended into the mixture of ingredients until its volume increases by approximately 20%. By comparison, ice cream may have an overrun as large as 100%, meaning half of the final product is composed of air. The high percentage of butterfat and egg yolk gives frozen custard a thick, creamy texture and a smoother, softer consistency than ice cream. Frozen custard can be packed in dry ice for shipping, but is rarely offered on store shelves. The process of making frozen custard can be labor intensive and time-consuming, which works well for individual stands maintaining a limited supply, but not for a commercial production line. A typical frozen custard stand often limits its offerings to a few flavors – Vanilla, chocolate, and a featured flavor of the day. This practice allows each frozen custard machine to be dedicated to one flavor run, and the quality of the products can be maintained. Consumer demand for a variety of flavors would also make commercial frozen custard difficult to market. Frozen custard is richer and creamier that standard ice cream because of a higher butterfat content, slower production time and less air blended into the mix. Frozen custard is most often served at 26 degrees Fahrenheit, a full 16 degrees warmer than the 10 degrees Fahrenheit at which ice cream is served. Frozen custard gets its creaminess from a higher percentage of butterfat compared to standard grade ice creams. Frozen custard is noticeably thicker than standard soft-serve ice cream because of the churning process inside the freezer unit. The beaters inside the chamber of a frozen custard machine turn much more slowly than those in a soft-serve ice cream or frozen yogurt machine. This slow churning prevents excessive air from being mixed into the custard as it freezes. As the frozen custard solidifies, it falls into a waiting chest freezer for serving. Hard scoop ice cream is generally higher in butterfat and overrun (14-18 percent butterfat and about 40-80 percent overrun). Gelato is also a lower overrun product, usually about 30 percent, but has only 2-8 percent butterfat, with most Italian gelato recipes only having 3 percent butterfat. Soft serve ice cream and frozen yogurt products generally have overrun in the range of 40-60 percent. Butterfat content typically range from 4-6 percent, but in the case of frozen yogurt and “non-fat” flavors can be 0 percent or has high as 10 percent for gourmet soft serve flavors. Frozen custard is a gourmet ice cream treat that first originated on Coney Island, NY as a carnival treat at the turn of the century. The popularity of frozen custard quickly grew and was the rage of the east coast. Many travelers had a chance to taste the new sensation and it quickly spread to the Midwest. In 1933, Chicago was responsible for first introducing frozen custard to the Midwest at the World’s Fair. After the fair, frozen custard became wildly popular in towns like Milwaukee, St. Louis, Kansas City and Lafayette, Indiana.